Featuring Kanye West, Kehlani, A$AP Rocky and more. 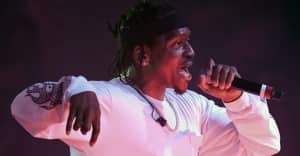 Pusha T's highly anticipated album Darkest Before Dawn arrives next week and today the rapper has shared the track list for the record. Not surprisingly, the album is stacked with features from heavy hitters like Kanye West, A$AP Rocky, J. Cole, and more. Pusha also debuted a new track off of the album, his personal favorite ""Crutches, Crosses, Caskets." Check out the tracklist below and pre-order the album on iTunes to unlock the new track.